For the current requirements click here. 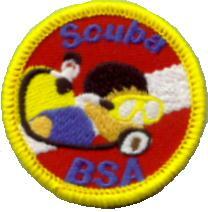 The Scuba BSA Patch is NOT worn on the Uniform. It is worn on the left side of the swim trunks. Before doing other requirements, successfully complete the BSA swimmer test. To begin the test, jump feet first into water over the head in depth, level off, and begin swimming. Swim 75 yards in a strong manner using one or more of the following strokes: sidestroke, breaststroke, trudgen, or crawl; then swim 25 yards using an easy, resting backstroke. The 100 yards must be completed in one swim without stops and must include at least one sharp turn. After completing the swim, rest by floating. Discuss the importance of using the buddy system at all times while scuba diving. Explain that a dive buddy is there to assist with the donning and doffing of equipment, to lend assistance in case of emergency and to share in the underwater experience. Remember, always dive with a buddy — Never dive alone! Review hazards associated with scuba diving, including causes of decompression incidents, and safety procedures to avoid them. Explain the importance of never using scuba equipment unless you are enrolled in a training exercise, or have completed a diver certification program, taught by a certified instructor. State the purpose of the following pieces of basic diving equipment: mask, fins, BCD, BCD inflator, regulator, air gauge and alternate air source. Describe how to locate the air gauge, and explain how to recognize the “caution zone” on it. Don and adjust mask, fins, snorkel, BCD, scuba, and weights with the assistance of a buddy, instructor, or certified assistant. Inflate/deflate a BCD at the surface using the low pressure inflator. In shallow water, demonstrate proper compressed air breathing habits; remembering to breathe naturally and not hold the breath. Clear the regulator while underwater using both exhalation and purge-button methods and resume normal breathing from it. In shallow water, recover a regulator hose from behind the shoulder while underwater. In shallow water, clear a partially flooded mask while underwater. Swim underwater with scuba equipment while maintaining control of both direction and depth, properly equalizing the ears and mask to accommodate depth changes. While underwater, locate and read submersible pressure gauge and signal whether the air supply is adequate or low based on the gauge’s caution zone. In shallow water, breathe underwater for at least 30 seconds from an alternate air source supplied by the instructor. Demonstrate the techniques for a proper ascent. *The counselor for Scuba BSA must hold an instructor rating and be in current teaching status with PADI, NAUI, SSI or other member of the RSTC in accordance with BSA scuba policies. Instruction must meet the minimum training standards for introductory scuba experiences set by the RSTC and guidelines provided in the Scuba BSA Brochure, No. 13-971. BSA scuba policies are provided in that brochure and also in the Guide to Safe Scouting. Counselors for Scuba BSA must hold current scuba instructor certification from PADI, NAUI, SSI, or other RSTC member organizations. Instruction must comply with RSTC standards for introductory scuba experiences. These minimum standards include instructor to participant ratios. In a pool, the ratio is eight participants per instructor. In a confined waterfront setting the ratio is four participants per instructor. Ratios may be increased by two participants if the instructor is assisted by someone certified as a dive master or assistant instructor. A second adult who understands the procedures should be present in case the instructor becomes incapacitated. Two-deep adult leadership is also required by BSA youth protection guidelines. Before participants are allowed in the water, they must complete a health history form designed for scuba activities. Instructors should use standard forms advocated by their certifying agency. Skill instruction must be conducted in clear, confined water. A swimming pool is recommended. Scuba BSA is ideally suited to winter programs using indoor pools. Two 45-minute sessions are recommended for instruction, practice, and completion of requirements. Although Scuba BSA is similar to introductory scuba experiences offered by various RSTC member organizations, those programs are not substitutes for Scuba BSA. All requirements must be completed as stated on the application form. The counselor may not omit, vary, or add requirements. In particular, Scuba BSA has a prerequisite swimming requirement, is only available to youth and adults registered in the Boy Scouting or Venturing programs (minimum age around 10 1/2), and does not include the option of an open-water dive. Local council programs may not compress or sell air for scuba use, or sell, rent, or loan scuba equipment. All air and equipment for local council Scuba BSA programs must be obtained from properly licensed sources, unaffiliated with the Boy Scouts of America and under the supervision of PADI, NAUI, SSI, or other RSTC-approved and certified scuba instructors. Individuals completing the Scuba BSA requirements qualify for a recognition card and patch. The counselor or unit leader should submit the completed award application to the local council service center. Full details, and the application form can be found in the SCUBA BSA pamphlet (No 19-515), available from local BSA Council Service Centers. A copy can be downloaded by clicking here.